Bikinis & atom bombs: Be inspired by everything. When we think about inspiration, what influences us most are ordinary people who have done extraordinary things. We appreciate when someone has the ability and willingness to be selfless, creative, innovative, or just dares to be different. Being ordinary and creating extra ordinary stuff. It’s one of fashion’s great mysteries. Where do designers find their inspiration? The birth of a trend has long been a source of debate. Inspiration can literally come from anywhere, be it family, music, streets, a crack in the sidewalk etc . There are no restraints as to what someone can draw from to turn a mere thought into a reality. In fact, fashion design is all about great inspirations. Today’s designs are everything from elaborate drawings in a sketchbook to creative photo shopping. Miniskirt: Did you know the origin of the miniskirts by Mary Quant’s was actually named after her favourite car – The Mini. According to her, miniskirts meant young, fresh, colourful and fun. The bikini: Louis Reard named his two-piece swimming costume after the Bikini Atoll, where the US military was testing bombs. He believed his revealing swimwear would create a shock similar to that of the atomic bomb. He sure did!!!!!! Versace logo: Gianni Versace’s major influence was Greek mythology – the logo for his company is the head of Medusa – thought to symbolize the empowerment of women. Through his clothing, Versace wanted to give women confidence and power, and this was shown through his choice of flamboyant textiles, bold colors and flattering cuts. Red-soled Louboutins: Christian Louboutin’s red soles were inspired by Andy Warhol and nail varnish. When designing a pair of shoes influenced by Warhol’s Flowers, Louboutin was dissatisfied with the outcome. While looking at the shoes, which had black soles, to try to figure out why they didn’t work, his assistant was painting her nails red. Seeing the polish, Louboutin grabbed the pot and lacquered the shoe’s sole, and an icon was born. We at MyWear® would like to be the bridge that leads artists to becoming entrepreneurs. We can provide you with all the tools you need to successfully launch your own clothing line. Your own website, Custom sizes, your own choice of fabric, Social media integration, advance designing tools, ecommerce, on demand manufacturing and shipment. You name it we got it. We have made sure that tools, technology and cost are no longer barriers. Just bring in your creativity, talent, drive and let’s get started. Is there a short cut to success? I’d love to give you a new and unique answer which would magically make all your problems disappear. But, unfortunately, there is none. So, I’m just going to go with the old fashioned epithets of ‘hard work ‘, perseverance, talent and a little bit of luck (although the law of attraction states luck itself is directly proportional to how hard you work!). A lot of budding entrepreneurs think that they can get a website, open a shop and customers will beat a path to their store. The reality is far different. With a billion websites out there, getting discovered, building the trust that gets a sale take a lot of time. Most new e-commerce sites don’t net a single sale for the first 3 months. You could do a simple google search to find hundreds of articles about hard work. I simply wish to give a more realistic perspective on the subject. In 1993, K. Anders Ericsson and colleagues asked musicians to estimate the amount of deliberate practice– full engagement in structured training activities designed to improve a particular aspect of performance– every week for each year of their careers. They found that on average, the most accomplished musicians estimated much higher amounts of deliberate practice than the less accomplished musicians. At age 20, the average estimated hours for the most accomplished violinists was more than 10,000 hours, whereas the average estimated hours for the least accomplished violinists was about 4,600 hours. The field of fashion is no different. Sure, talent is important, but consistency, hard work and dedication to the art are even more important. Opening an online store is easy, anyone can do it. But making it successful requires hardwork, perseverance and motivation. Maintaining its standards consistently with new, catchy designs, customer service, keeping up with trends, research etc are the tough parts. It’s even tougher doing all these knowing that you statistically won’t be getting even a single order for at least 3 months from starting your store. These are the parts which will determine if you will be a success story or a cautionary tale for others. If you say, “I’ve tried all this, still no success”, here are few more case studies for you, Colonel Sander’s chicken recipe was rejected 1099 times before going mainstream, Henry ford failed in five businesses before starting ford motors, Walt Disney was fired from a newspaper early in his career because “he lacked imagination and creative ideas”. So what is the secret sauce to building a new digital business? Be active on social media like Facebook, Pinterest, Instagram and share your work. In the end it takes talent, nurturing, motivation, persistence and hardwork to build a success story. There are no shortcuts here! Though it might seem as if the artistic aspect of fashion is missing in the bustle of commercial marketing and constantly changing trends, it actually is not the case if you look at the work of some of the most accomplished designers today. Fashion creates a gate way for the human mind to express an inner truth, a belief or an idea, about oneself or the external world though the canvas of clothing. An emotion one can wear, which reflects themselves or the world around them. Every aspect of a garment can tell a story, from the colors, texture, cut, drape to even minute subliminal details such as buttons which can signify strong ideals such as aspiration or innocence. Now, owing to the union of technology and fashion, expressing yourself has become easier than ever. Through the MyWear® designer platform, you now have a blank canvas. Express your own emotional spectrum by launching your own clothing line under your own label. Launch Your Own Clothing Line. Custom Made, On-demand! MyWear® is the only integrated platform to let you launch your own line of apparel or accessories, designed, produced and delivered to order, under your label, with no minimum order quantities. MyWear® provides you with everything you need: design tools, e-commerce, social media integration, manufacturing & drop shipping! If you are wondering, is talent alone enough?, you need to look at industry legends like Coco Chanel, who learnt the art of sewing while being raised in an orphanage or Georgio Armani, who started his career from a garments shop, where he assisted a photographer in arranging the window, or let’s take the example of Calvin Klein, who started his career as a complete loner, with no connections nor money, except for what he made helping his father at his grocery store. The simple truth is, in addition to being exceptional fashion designers, these greats were also exceptional business men and women, scouting the market like a hawk, searching for opportunity, flaws, chinks in the armor where they could step in and offer their solutions. For instance, Rene’ Lacoste designed a game changing shirt with a buttoned neckline and short sleeves in a time when tennis players were accustomed to rolling up their sleeves to get a little relief. Lacoste saw opportunity, stepped in and offered his solution. A simple formula. These extraordinary people loved their art enough to learn and develop a new line of business. Now, we have made the barriers much lower for an enterprising designer to get started on their own. Choose from our wide range of product silhouettes across customer segments – Tees, Tops, Dresses, Backpacks, Messenger bags and Raglans across Kids, Men, Women and Extended Sizes in Synthetic, Cotton, Polyester, Silk or Blends. Just design on our 3D tool and publish to your store and the product is ready for purchase! No inventory, no pre-orders, no minimums – we will custom make and drop ship every single order, under your label, within 2 weeks. Need your own custom product or special fabric? We will design, pattern-make and set up manufacturing just for you, for a small fee. Don’t be restricted to designing inside a box! 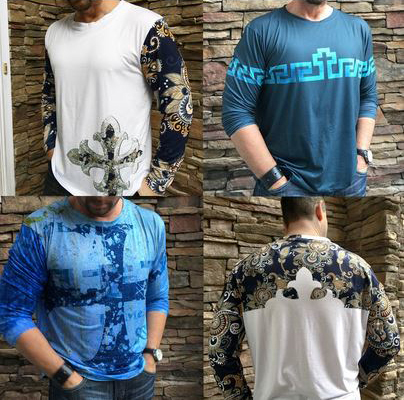 MyWear® is the only platform that supports full-bleed prints with custom sizes and choice of fabric. Go ahead and unleash your creative skills without any technology limitation. Promote your products on Facebook, sell on Facebook in-app store, promote on Twitter, Instagram & Pinterest with a single click from our social dashboard. When your customers order on any of your channels, we will manufacture and drop ship it! Launch your line, under your own label. manufacturing so any budding designer with talent and entrepreneurial skills can get started. We have made sure tools, technology or cost are no longer a barrier. You just need to add your talent and creativity to the mix! Are You Taking Advantage of These MyWear® Tools? Now that you’ve familiarized yourself with the MyWear platform and designed your first item, you might be wondering if there’s any hacks or tools for even more control during the design process. Lucky for you, there is! 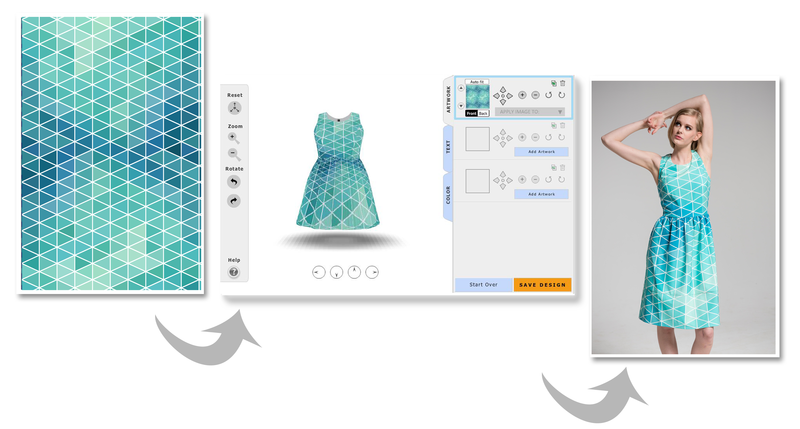 Here we’ll walk you through some of the lesser known tools to utilize while designing with MyWear! If you only want to apply art to specific sections of your design, use the “Apply Image To” dropdown to add art to desired panels, or uncheck components where you don’t want your art to be applied. 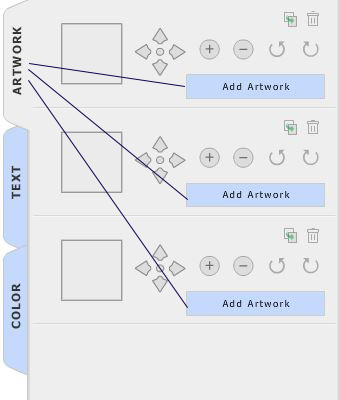 If you’re planning on using more than one artwork on your piece, you can use the additional artwork tabs to do so. When combined with “apply image to” you can create pieces that feature multiple works of art on different sections, or it can be used as a tool for even more control over the placement of your art and how it will look on your garment. 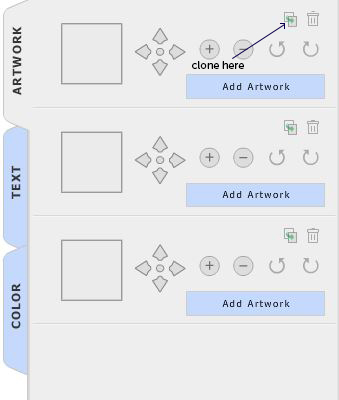 Use the clone tool to clone your art to a second (or third!) artwork tab. As you’ve probably figured out, the four arrows located in the artwork tab will align your art further to the left or right, or higher or lower. But, there’s also a small center button which will make your arrows move in smaller increments. Use the layer up/down buttons located to the left of your art thumbnail to change layer order. To set a logo, use a .png file (without a background) and overlay it on top of the other layers. To apply solid color, go to the color tab and uncheck “art” in the component you’d like to apply color to. Click the color box and use the dropper to choose a color or enter a color hex code. You can also find the “mirror” and “copy” functions located in the color tab. Use these to copy or mirror the art from one side onto the other. 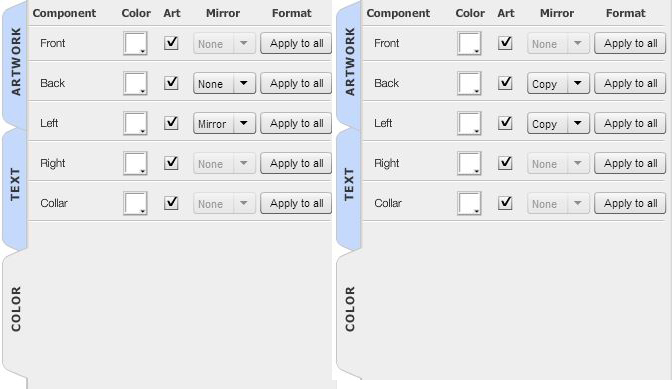 For example, for symmetrical sleeves, use the color tab’s dropdown menu under “Mirror” and select “Mirror” to make the left component match with the right. Select “Copy” to apply an identical copy of the art onto the other sleeve. Once you get the hang of these tools, you’ll find many inventive ways to use them to create truly unique items that your customers can’t find anywhere else. Want a quick visual refresher course? Look no further than our video tutorial! 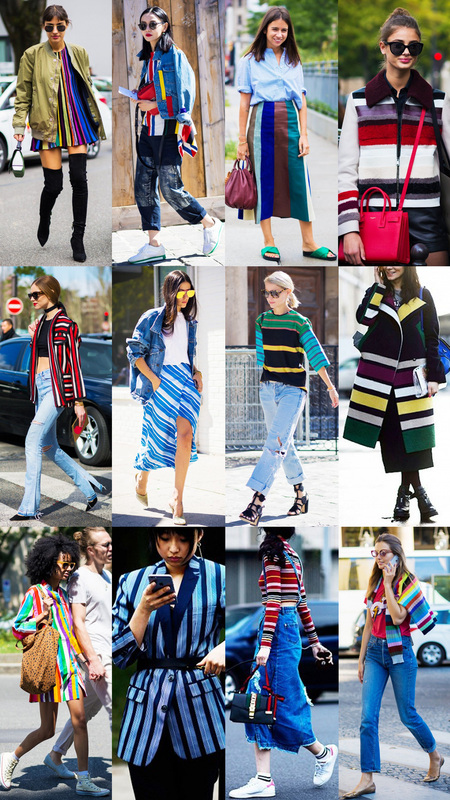 Stripes are easy to create, compliment other prints (think polka dots or floral pattern mixing), and go well with multiple colors and styles. Simply put, they’re perfect for incorporating into your MyWear® designs this summer! To design your own in Photoshop, use the rectangular marquee tool to select the size stripe you want. Then, use the paint bucket tool to fill in the selected area with a desired color. Repeat! 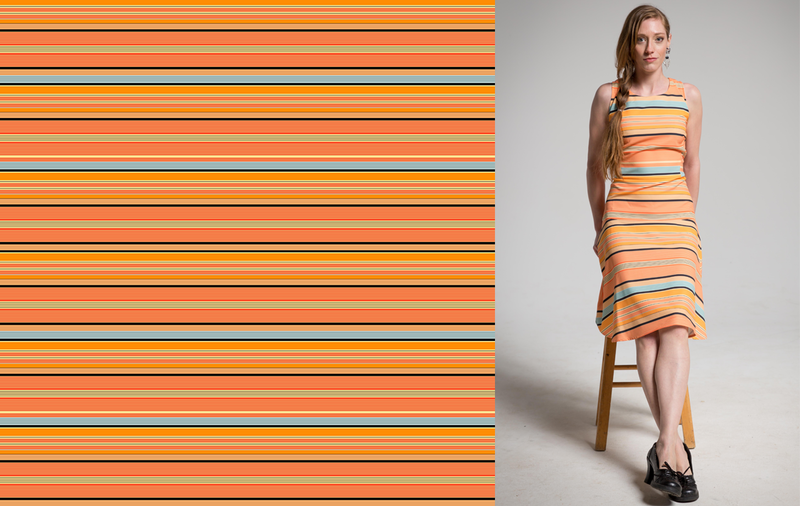 Copy and paste your stripe design for an ongoing pattern. Want to switch it up with a new color scheme, you chameleon, you? No problem! 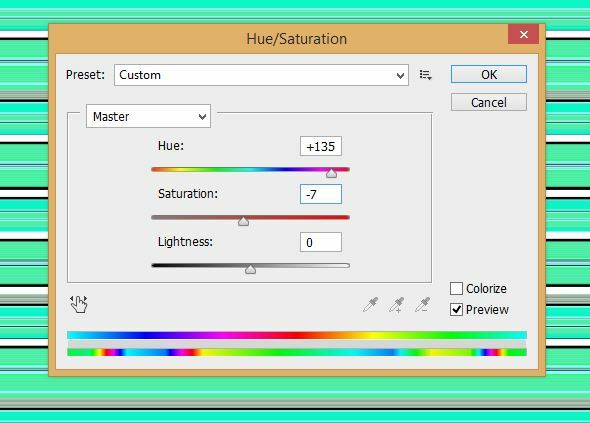 Use the Hue/Saturation dial located in adjustments to give a quick color change! As mentioned above, pattern mixing is a cinch with stripes, just remember to use at least one matching or complimentary color! Most importantly, have fun and infuse your own personality into this classic! Until next time, happy designing! 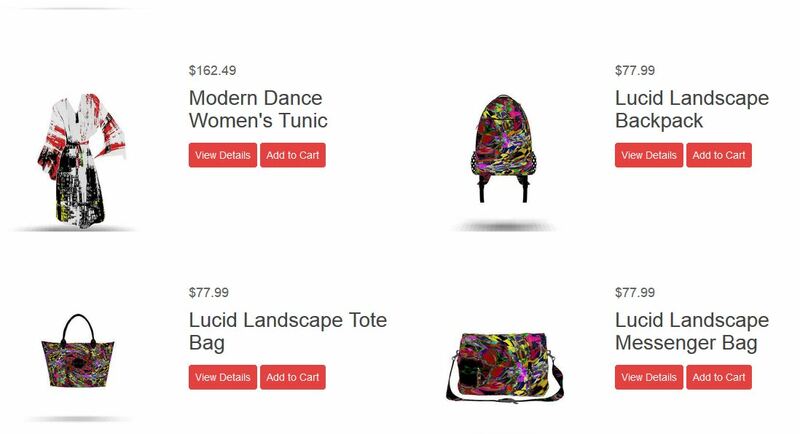 For those of you not in the loop yet, MyWear® is a new on-demand eCommerce and manufacturing platform for artists and designers that gives you the ability to launch your own line of clothing and accessories for free. The integrated platform provides you with everything you need to start selling your own merchandise: design tools, a branded e-store, pattern generation, supply chain, production, and free shipping & delivery to over 10 countries. We’re also the only platform to move beyond the heat-pressed T-shirt, offering apparel in a variety of knits and woven fabrics and advanced silhouettes, like custom dresses, jackets, and even chinos. 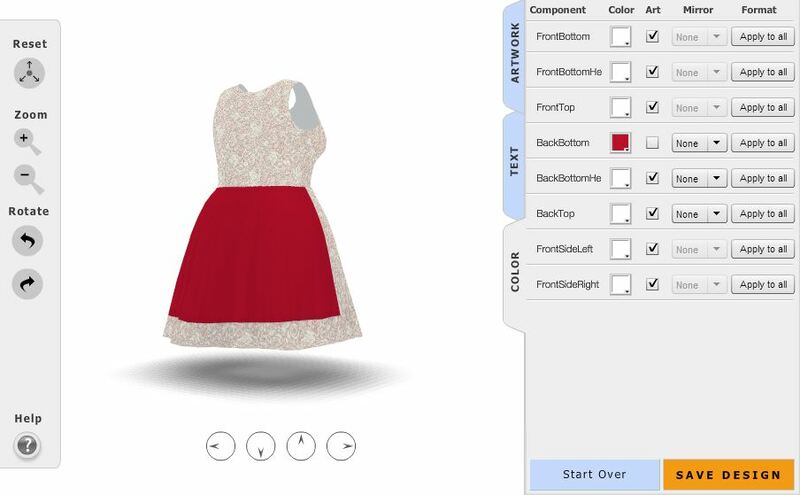 Upload your art and design products without restrictions on MyWear®’s 3D model. Publish to make your design immediately available for purchase. After your first sale, link your Stripe account. You relax while we take care of manufacturing, shipping, and customer service! To design on the 3D model, first, you’ll want to upload your artwork. Art can for this can be created in a number of ways including Photoshop, Microsoft Paint, Adobe Illustrator, a photograph, or a picture of something you’ve drawn/painted. We recommend uploading 300 pixel/inch resolution, so your artwork is large and high-res enough to cover your design in full. 2. 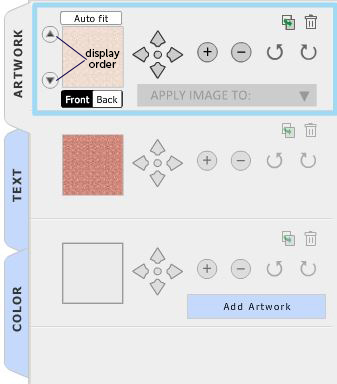 Hover your mouse over the art you uploaded and select “Design your own”. This will take you to a menu of products to choose from. 3. Now, we get to the fun stuff! When your design first appears on your product, in some cases it will show as a rectangle, one that most likely doesn’t fit the entire piece. There’s an Auto Fit button which will automatically fill the entire product. 4. Or, in order to get your print to cover your product entirely, you’ll want to use the plus sign to scale the art to the whole piece. To make the print smaller, use the minus option. Use the arrows to align it further to the left or right, or higher or lower. The small center button will make your arrows move in smaller increments. 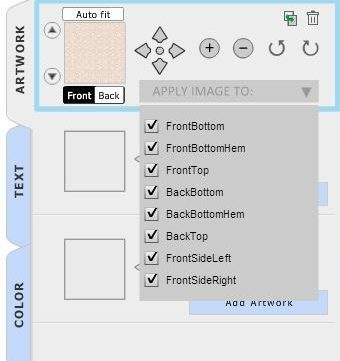 If you’re planning on using more than one artwork on your piece, you can use the additional artwork tabs to do so. 5. 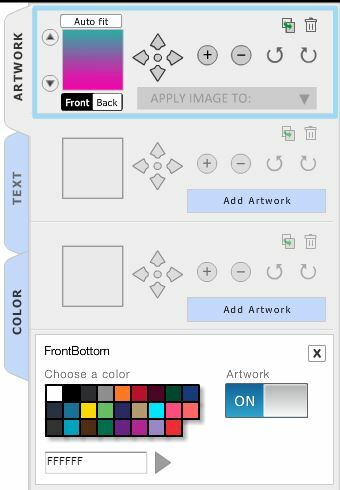 To apply color, select the area of your product you’d like to fill and turn artwork off in the color tab, if needed. Choose the color you’d like to apply to the selected section. 6. When finished, double check to make sure art is covering the entire piece and save design in bottom right corner. Now your design is up and available for purchase on your MyWear® store! Share your newly designed piece with family, friends, and your social media audience! When an order is placed, we’ll manufacture and ship it, and credit your dues to your account. Great news for those of you looking to increase your store’s exposure! MyWear has released its new Facebook app! Now, with our new app, you can add a MyWearStore “Shop” tab to your Facebook page, where anyone visiting your page can see a catalog of your products, view the details, and shop from Facebook! We’ll receive, process, and ship the product and credit your dues, as always. To install, login to your account on LaunchMyWear.com and click on the Facebook cart (top right). From here, select which page you’d like your store to appear on and click “Add Page Tab”. That’s it! Go checkout your new MyWearStore, right on your Facebook page. Have you heard the news? We’re very proud to announce the launch of our new marketplace, MyWearStore.com! MyWearStore is the world’s first and only collection of completely customizable apparel and accessories, designed by a talented community of independent LaunchMyWear artists and designers. Our marketplace allows customers to discover new, emerging artists, designers, and trends – all at affordable prices. Customers have the option of personalizing every aspect of their order, from size and fabric, all the way down to the actual design itself. In turn, independent artists and designers are able to sell their own lines of apparel and accessories, under their own labels and with no minimum order quantities. We believe this is the future of art and fashion: an ecosystem of innovation, on-demand production, and full customization. Once upon a time, having an up and coming designer make you a one-of-a-kind piece in your measurements and choice of fabric meant you were insanely wealthy. 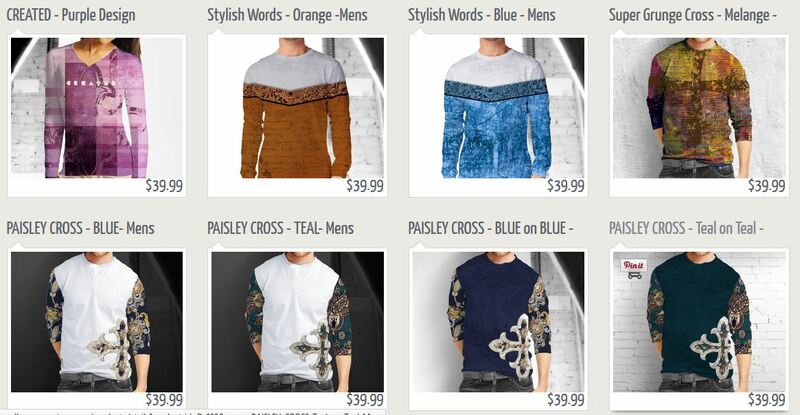 Now, with MyWearStore, you can have exactly that, at less than department store prices. We live in the future, guys! I’ll start with one of my personal favorites, the folky designs of Ms. Ranka Stevic. Ranka uses patterns and prints that I would normally associate with embroidery, but updates them with modern colors and sharp angles. This marriage of tradition and modern design feels both familiar and fresh. One of our earliest supporters and favorite designers has been Inspired Fashion. 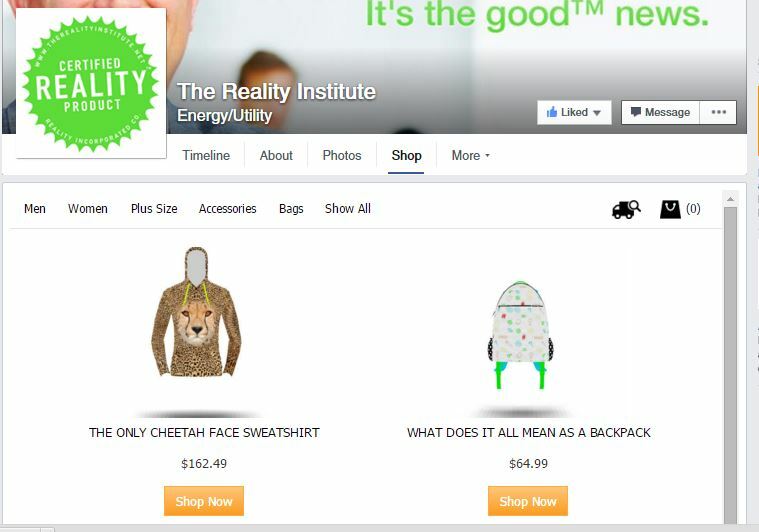 Inspired offers a huge range of unique apparel, with a positive message to boot. Last but not least, my favorite, Reality Inc., brings technicolor pop art to the table, combining satire, modern art, and a Warhol-esque approach in his designs. We’re expanding our marketplace constantly with new designers and a huge range of products in the pipeline. 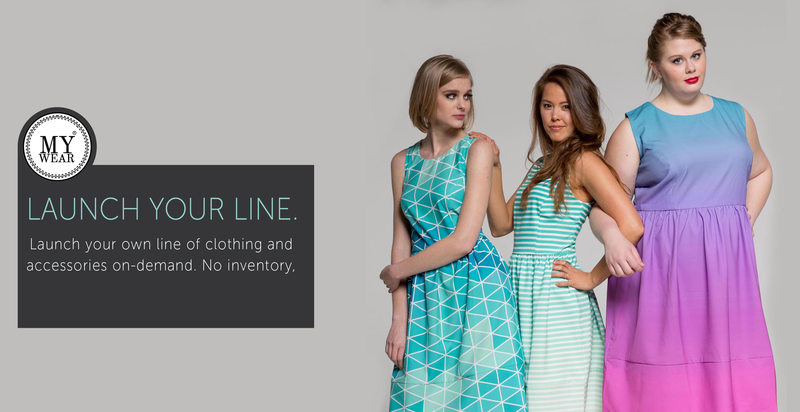 Those of you interested in creating your own line can register on LaunchMyWear.com. Those looking to support the artist community and snag your own one-of-a-kind pieces can visit MyWearStore.com.